Does LotWin Really Work? Read 2 Reviews! LotWin is a lottery software that simply uses past results to predict future numbers for lotteries. They use advancing wheeling systems, statistics and filters. LotWin Software Exposed — Only Free Demo Version Is Available! We all want to win big jackpots. We’d all like to know the secret to winning lotteries. 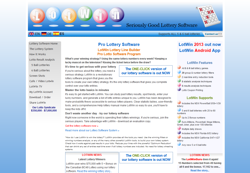 In looking at LotWin Software, I initially thought I might have found a lottery system to help win. Their site is professionally designed with clearly set out the information. Well, that’s what I thought. Then, I started digging. Here’s what I found out! LotWin is a lottery system that simply uses past results to predict future numbers for lotteries. They use advancing wheeling systems, statistics, and filters. This can be used for most of the big international lotteries and is available for use on your computer and as an android app. They do offer a free trial version which I couldn’t resist making use of even though it did involve disclosing a bunch of personal information during registration. Lotwin claims that that unlike other inferior lottery software, theirs gives you the freedom to customize your lottery schemes from every possible entry to narrowing down the numbers. Much to their credit, the developers of Lotwin Software amassed a lot of powerful tools that can process a lot of information in a short period. They list the different international lotteries as well other games that it can be used for. There are also screenshots and other support tools to try and make this user-friendly. I’m just not sure what you’d do with it. In looking for complaints, all I found was one-page websites that were created by either affiliates or the developers themselves to sell LotWin. I have serious reservations not only on many of their claims but the concept that number probabilities will win that big jackpot much less regular smaller prizes. I also have problems with a website that claims a lottery winner (second prize) won using their system, but in following the research it was back in 2008, and there was no independent verification that he used LotWin. The guy’s name comes up on a variety of sites saying he plays there. Is LotWin Software Worth Your Money? Some people do think statistics on the probability of numbers in playing lotteries will help a person win more. To date, I have not heard of a single person that has. Syndicates are supposed to increase your odds, but then that’s simply playing more tickets. I am not aware of anybody who has stood up and said I won by wheeling or numeric probabilities. LotWin Software is an application that creates numeric statistics for a variety of lotteries using past results. It’s no more and no less. They must have put a lot of time into inputting all this information and given it is a monthly subscription; I guess it updates itself with the latest info. They don’t make any guarantees at the same time; they do say “Right now someone in the world is spending their lottery winnings.” I agree with that, but I don’t think it’s going to be a result of using LotWin Software. I can’t believe this powerful software has only received one review – a 2 star one. The things this software will do is simply amazing even if it WOULD BE BETTER with more filters added to it. This is not prediction software (it is filtering software) which gives people reason to give it negative reviews. It does too much to explain its usefulness here but it is worth taking a look at. The only drawback is the price. I don’t believe that there are any statistics that will help choose number and that includes this software. Lotteries are totally random. There is as much chance of the same numbers coming up as others. I’m sticking to spending my money on lotteries and not software to help me choose them.